Thanksgiving seems to be the perfect time to spend an hour in the shoes of another. During the summer here at A Butler's Manor, we offer complimentary shuttle service to Cooper's Beach in our roomy Buick Roadmaster (a.k.a. the Butlermobile), which saves our guests the price of parking ($40 per day). And as many of our guests come from Manhattan and don't have a car, we also pick up and deliver from the Hampton Jitney terminal and the Southampton train station. Because we are an easy walk into the center of Southampton Village, for a weekend visitor from the city this is probably all the transportation they need. For a longer stay, or if they wish to wander farther afield, they generally rent a car. But a distinct segment of our visitors from abroad, particularly the UK or Australia, come for several days and may not be comfortable renting a car and driving on the "wrong" side of the road. In most cases, this trip to the Hamptons will be their only one, and as much as I love Southampton village, I want our visitors to see all of the Hamptons and beyond...to really experience the entire area. And therein lies the rub. Unlike NYC, we don't have a large, well-integrated public transport system. We have the Long Island Railroad, but there are only three or four trains per day. And the train stops in Bridgehampton, East Hampton, Amagansett and Montauk, but you'll never see Sag Harbor that way. Taxis are expensive and not necessarily geared to a general tour of the area. Limo services such as East End Limosine, which can provide a general tour, are lovely but even more expensive. There are a couple of van/limo tours geared specifically to the North Fork wineries, and we particularly like Vintage Tours, but it is often difficult to get them to come over to the South Fork to pick up only two guests. And not all of our clientele want to spend their money this way. We do have a public bus, which currently runs every day except Sunday. Needless to say, Chris and I have never ridden it. Until last Tuesday. After our guests checked out that day, we had the entire afternoon and evening free. So we decided to see how our wheel-less guests would experience the East End's public transportation. It was a grey, dank day, with showers threatening when we picked up the S92 bus near Roger's Memorial Library in Southampton. You need exact change, but it doesn't have to be coins -- there is a bill inserter, which on our adventure, I saw that everyone used except me. My first impression was favorable: busses are new, clean, and well-maintained. Okay, so the seat could use a little more padding. But hey, for $2, you're not likely to get the Hampton Luxury Liner's posh leather seats. We rode through Bridgehampton, then north on the turnpike to Sag Harbor, then southeast down Rte. 114 to East Hampton and disembarked near the train station there, a journey of about 35 minutes--not bad for probably a 20 mile trip. After wandering in town and enjoying a coffee at Starbuck's, we boarded again, retracing our same route, then continuing through Hampton Bays, up through the county seat of Riverhead, and out to the North Fork. You can't get to Tanger Outlet Mall directly (though you could with a transfer) and it's not a particularly impressive tour of Riverhead. But once beyond the county seat, the bus journeys straight up Rte 25 through the Long Island Wine Trail, all the way to Orient Point. With the many wineries side by side especially in Cutchogue, you could actually go wine tasting on the bus. Hmmmm. The journey to Greenport from East Hampton totalled about 2 hours and 15 minutes, and we decided to hop off there and have an early dinner before heading back home. Upon reboarding, we found a photographer from Long Island's Newsday newspaper on the bus, working on a story, though she didn't say what it was about. She was enchanted with our little adventure to ride the bus from one end of the route to the other in order to be able to advise our guests, and snapped a few dozen photographs of me and of most of the others who subsequently boarded the bus for points east. The following morning, a friend called us up. "Kim, is that your picture in Newsday today?" Sure enough, there I was...headlining an article about a potential fare hike and its impact on those who rode the bus, quote, "often, the poorest of the poor." So I just became the poster child for the poorest of the poor? Well. I guess we need a second job! Too bad. We think ours was the far better story! Our adventure taught us that we could safely recommend the bus for wheel-less guests looking to head farther afield than our village...one can easily journey to any of the points mentioned above, and with little effort, transfer to other lines that will go all the way to Montauk or other places. Busses run about an hour apart, which seems dreadfully infrequent when compared to NYC busses (or, yikes, the subway! ), but when compared to three trains per day, is a veritable abundance of transportation...an easy, clean, safe and inexpensive option for sightseeing when you don't have your own car. And the people watching is definitely interesting. Students going to class, people taking their laundry to the laudromat, mothers with small (remarkably quiet!) children, people en route to work, or to the store...regulars who knew the bus driver and chatted with him as he drove, others plugged into their iPods and enjoying downtime. It was a truly interesting day. But oh, how Chris and I gave thanks that evening for the blessing of having our own transportation! November, and things are slowing down. Chris and I actually had a day off a week or so ago. It was a gorgeous autumn day and we decided to do a little sightseeing in our own backyard, for the dual purpose of enjoying ourselves outdoors and to be better able to advise our guests. In the nearly twenty years that we've lived on the East End, we've never been hiking at any of the three most popular locations out here, namely Mashomack, Hidden Hills, or the Elizabeth Morton Wildlike Refuge. We decided to start our exploration with Mashomack, just across the bay on Shelter Island. There are four well-defined and marked trails of varying lengths, from a one-mile wheelchair-accessible trail to a ten-mile hike that overlooks Gardiner's Bay. Chris and I chose the six-mile Green Trail, marked by the emblem of the osprey. 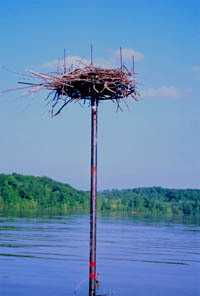 The osprey is one of the East End's most celebrated examples of the power of environmental concern: the breeding population, once decimated by the thinning of their eggs caused by widespread use of DDT, has rebounded from 150 breeding pairs in 1969 to well over 230 pairs today, taking the breed from the Endangered list to that of Special Concern. Osprey nests are visible along many coastal wetlands, but Mashomack is home to one the largest concentration of nesting ospreys in the area. The nests are remarkable as they resemble chimney-sweep brushes of the sort you remember from the movie Mary Poppins; birds create large nests in the tops of dead trees or, more commonly, on human-created upright structures resembling telephone poles. The ospreys have flown south for the winter now, but lots of birds and other wildlife remain to be seen on the trails. One of the more remarkable sights we saw was a red-tailed hawk eating his lunch on a trail-side post in an open field. Fields, wetlands, coves seeded with oyster and scallop beds, pine swamps...the variety of ecosystems within such a relatively small area was incredible. In addition to being a wonderful place to breathe and appreciate nature, the Nature Conservancy has on site a charming visitors center with interactive diplays on all aspects of the flora and fauna. We spent quite a bit of time there, playing with the displays and discussing what we'd seen with the very knowledgable and friendly Nature Conservancy staff member. The entire East End is a respite from busy city and suburban living, and we realize how very lucky we are to live and work in such a beautiful corner of the world. Even so, as we drove away late in the afternoon, bound for the South Ferry back to A Butler's Manor, Chris commented that our afternoon walk in the woods truly felt like we'd been on vacation!